Malaysia’s award-winning animation provider, Animasia Studio and China’s ZeroOne Animation launched the trailer for their upcoming $8.5 million (RMB60 million) co-production, Chuck Chicken the Movie (also known as KungFu Chicken in China) at the Hong Kong International Film and TV Market (FILMART) 2017. The 3D CGI animated movie, which just commenced production, is set for China and regional theatrical release by the end of 2018. The story and script development process started since November 2015 and it was a collaborative effort headed by China’s award-winning scriptwriter He ZiZhuang (winner of the Best Script award at the 20th China Film Golden Rooster Awards), Helen Dong (Pet Pals) and Malaysia’s ahLoong (Bola Kampung the Movie) — who is also the animation director for the movie. Chuck Chicken the Moviefollows Chuck, Flick, and Wing’s new life in the city far from their home in Rocky Perch Island. Chuck begins to start his own ‘Golden Egg Security’ company in the new city but unfortunately the traditional business model does not suit the needs of the modern city. Just when they are getting frustrated, Chuck discovers the “Ultimate Security Combat Competition” which could save their day. “We are extremely excited to commence the production ofChuck Chicken the Movie with ZeroOne Animation and launch the trailer at HK FILMART 2017. We have also attracted a leading cinema chain and distributor from Malaysia to represent and distribute the movie to key Southeast Asian theatrical markets and we will announce the line-up of our distributors for other key markets soon,” said Animasia Studio, managing director, Edmund Chan, who is also the executive producers of the movie together with Raye Lee and Helen Dong. The animation studio also announced key partnerships with Guangzhou’s TangChao Animation Technology as their merchandising partner to invest and manufacture more than 200 types of Chuck Chicken toys and merchandise, China’s Leader Reputation Network Technology to develop a range of Chuck Chicken mobile contents and games for China and regional distribution, and China’s premier VOD platform iQIYI to invest and distribute Chuck Chicken mobile games in China. 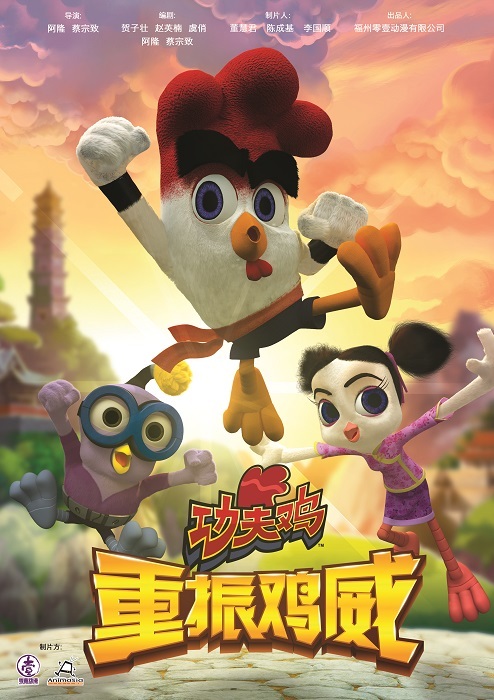 The movie is a spinoff from the successful animated TV series of the same name, which premiered on major provincial TV Stations in China such as CETV-1 Channel, Shenzhen Media Group Kids Channel, Zhejiang Television Kids Channel, and Dalian Television (DLTV) Kids Channel, besides Disney China (including Taiwan, Hong Kong and Macau), Disney Southeast Asia, and Nickelodeon India (including South Asia). Besides the success on linear platforms, the series has also garnered over one billion views on iQIYI.